Description: Biennial herb to 75 cm or more high; stems densely hairy with fine, spreading hairs. Leaves on stems oblong to lanceolate, to 20 cm long, 25–35 mm wide, both surfaces densely hairy, the base subcordate and stem-clasping, sessile or very shortly petiolate. 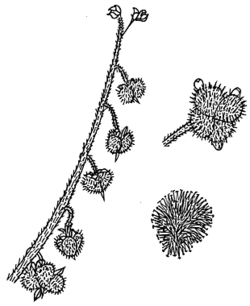 Sepals ovate to oblong, 6–8 mm long, nearly free from each other, enlarging as the fruit matures. Corolla 10–11 mm long, pink to blue with darker reticulate veins, glabrous. Stamens inserted towards the base of tube. Mericarps ovoid, 6–8 mm long; outer face convex, densely prickly. Distribution and occurrence: naturalised in Eden district. Native of S Europe.